In her paper, ‘Christian attitudes towards financial partnership for advancing the Kingdom of God’, Mary Njeri makes a number of very perceptive observations of Matthew 25:14-30 (the parable of the talents – incidentally a an appropriate one for Tuesday of Holy Week). The motivation to be about the business of Kingdom investment is entering into the Master’s joy. He is a happy God and those who see that, and steward his gracious gifts now looking forward to that, he welcomes us into his inter-Trinitarian happiness. The motivation not to be about the business of Kingdom investment is seeing the Master as a ‘hard man’, a joy-sucker, a selfish taker, rather than the Good Sower that he is (cf. Matt. 13). The character of the non-investor is described as not only wicked but ‘lazy‘. I had not noticed this before. Njeri brilliantly connects this with the analysis of sloth by Tony Reinke in the DesiringGod book Killjoys. There, Reinke shows that laziness/sloth can be expressed in what at first seem very different ways – the sluggard (wanting quick fixes rather than working), the workaholic (working hard but not for the things that matter), and the zombie (sleepwalking through life addicted to distraction and triviality) – all united by a fruitless pursuit of leisure and comfort, a lack of love for the church, the poor and the lost, and a “boredom with God.” The wicked servant in the parable buried his talent in the ground because he was lazy – he had lost his appetite for God’s joy. Whether he was lying in bed or whether he was rushing about madly working every hour to build his career or whether he was going through the motions of life checking his smart phone every 30 seconds – he was not excited about the Master and his Kingdom. And the warning is close to home. 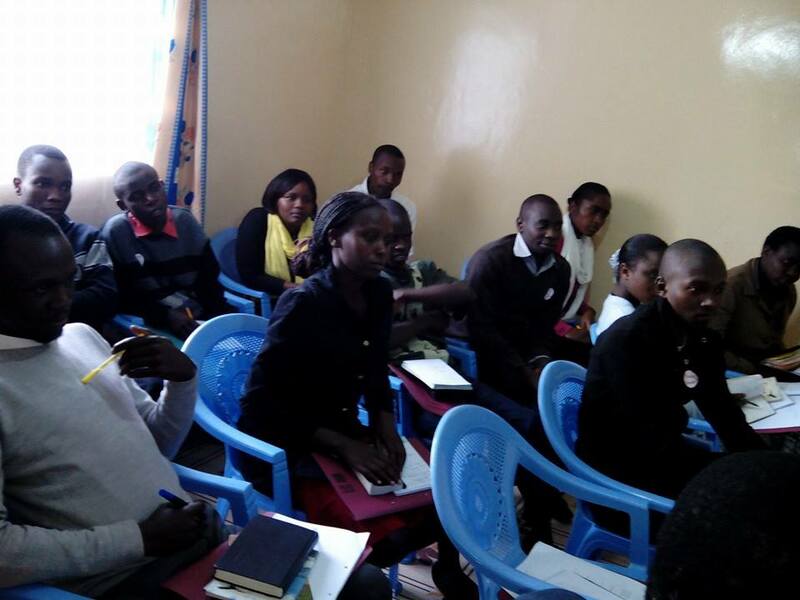 As Njeri says, “We are [largely] a desire-less church, unenthusiastic about the kingdom of God. We are caught up in just fulfilling our earthly obligations and then having the rest of the time for our comfort.” The answer is meditation on points 1 and 2 above. until the return of the Son. If you’d like to get investing in Kingdom work today and multiplying disciple-making disciples, then why not consider partnership with iServe Africa, locally through MPESA or EFT or internationally through the iServe Africa UK Trust or the Crosslinks iServe Africa Project Fund. A reminder of what Partnership Development is all about and some practical resources. On evangelism see 2 Ways 2 Live and 3-2-1 and something on the powerful combination of objective truth and personal joy. On guidance see What’s Best Next and particularly What if I don’t know my life work? Day 2 and the new apprentices are still handing in there, enduring the cold of Sigona and engaging really well with one another and the Word. 1. In the beginning God created the Earth and gave it to one couple Adam and Eve. They were the sole owners of the planet Earth. Think about it! Given to them by God! That was before the fall of man! That is too much wealth. 2. Then God called Abraham and Sarah and blessed them “…The Lord had blessed Abraham in all things” Genesis 24:1 Abraham had so much material wealth that he had to part ways with his nephew Lot because the pasture could not feed all their animals together. Abraham had over four hundred men working in his ranch, with their families. That is employment. 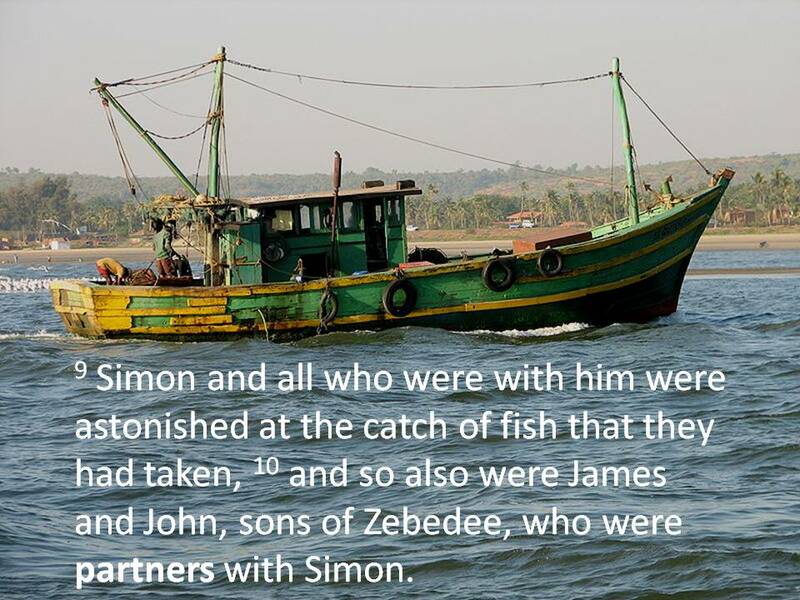 When Sodom and Gomorrah were attacked and Lot captured. Abraham got the news, he took his four hundred servants and pursued the enemy defeated them and recovered all and restored to the kings what they had lost. On his way back he met Melchizedek the priest of God and gave to him tithes of all. The first tither in the Bible. 3. David was blessed materially no wonder he could provide materials to build God such a magnificent house but Solomon is the one who built it . Then Solomon offered 120,000 sheep and 22,000 oxen in dedicating the Temple. Does this sound like poverty to you? 4. In Jesus ministry there were no offices and office bearers, but there was a treasurer…. Judas! Why? Could it be that Jesus was teaching us something about money in ministry? Yes he was. Money is the mode of exchange in this world….ignore it to your own destruction. Let us rightly divide the word of truth. Money if not put in its proper place can ruin your life…. for lack of it or much of it. So be realistic. Judas misappropriated ministry money. He also said what a woman spent on Jesus was a waste. He sold Jesus for 30 pieces of silver, then committed suicide. Think about it! One of the twelve disciples of Jesus committed suicide! On the other hand when Jesus was crucified and died on the cross, the disciples ran away. It took two men who had both affluence and influence to reach Pilate and demand for the body of Jesus and give him a descent burial. That was Joseph of Arimathaea and Nicodemus. Where were those poor believers at Jesus greatest hour of need when he could not do anything for himself but needed someone’s help! Adam and Eve were given dominion over the living things of the earth (Gen. 1:26-28), given free reign to eat from any plant or tree (Gen. 1:29; 2:16) and given the job of working the garden (Gen. 2:15) but I can’t see anywhere that they were given the earth. The LORD’s making of the earth (and all who dwell in it) means that it is all his (Ps. 24:1-2). If there was an original giving of the earth it was a giving of the earth to the Son. All things were created for him (Col. 1:16). He walked around the garden as the owner. Adam was the priest who’s job it was to be a faithful servant in God’s house, to guard the garden tabernacle, but he was not the owner or builder of the house (cf. Heb. 3:3-6). Adam was indeed appointed king of the world but the biblical idea of a king (in great contrast to the pagan view then and now) was not that the king owned the land and people but that he was a steward, an under-shepherd, serving God’s people in God’s land. A key point in servant leadership there. Certainly Abraham was wealthy and God’s blessing of him included his wealth. It shows that God is not anti-wealth and it is possible (like Job) to be wealthy and a believer. But in applying all this to those of us who are by faith children of Abraham we need to go through Galatians 3 and see our real blessing there. On the question of tithing and whether Abraham sets a precedent in Gen. 14 see the article by Kostenberger page 3-5. Solomon is not a great positive example of wealth. Though his wealth was in the first place God-given (1 Kings 3:13), the writer of Kings is subtly but clearly making the point in 1 Kings 10 that what Solomon was doing in terms of accumulating vast amounts of gold and horses is in direct contravention of the Kingship code of Deut. 17. It could even be that the famous number of the beast (Rev. 13:18) alludes to the amount of gold Solomon received (1 Kings 10:14). And then you look at Ecclesiastes. Certainly money is very useful (Eccl. 10:19) – no-one is denying that – but at the end of it all Solomon found all his wealth meaningless and unsatisfying (Eccl. 2). Our brother makes lots of good points from Jesus’ ministry on the importance of money and using it well for gospel purposes and with proper accountability being aware of the temptations. As we’ve said several times now, we are not against money or using money in life and ministry. There were obviously wealthy believers and those with financial means who supported Jesus in his ministry and who in the early church made their homes available for the church to meet in or supported the mission of the apostles and evangelists. Jesus talked repeatedly about money and we don’t want to avoid the subject. 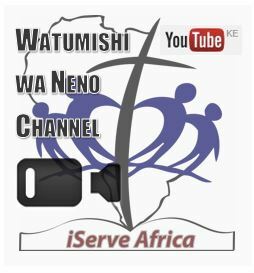 In fact if God moves you to support the ministry of iServe Africa please do that right now – in Kenya or from overseas. It would be great to be in partnership! Lack of graduates going into gospel ministry – often despised as a low-paying job for those with no other prospects. Mission viewed as a wazungu enterprise partly due to early missionaries not passing on a vision for mission and doing mission in a resource-intensive way that national believers could not replicate. Changing perceptions on the points above. Easier international communications and exchange of ideas. National mission mobilisation movements such as Finish The Task. Growth of indigenous mission agencies such as Sheepfold Ministries (good friends and close partners of iServe Africa). Some churches becoming mission focused and sending missionaries (e.g. 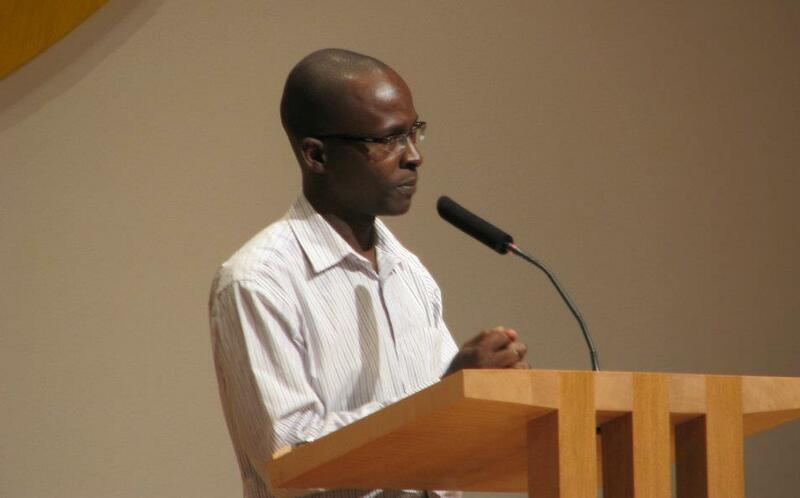 an alumnus of iServe Africa due to be sent out by a church to North East Kenya in a month’s time). Some African professionals moving out of their comfort zones to less secure places to offer their skills in the service of the gospel. “Individual African brothers and sisters who have almost single-handedly pioneered mission service, often in very challenging contexts.” Their amazing stories often overshadowed by those of Western pioneers. “We need to reject the “Get-Rich-Quick Syndrome”!” Often the motivation for mission and church planting is to found a well-paying business rather than to extend the kingdom for the glory of Christ and the good of others whatever the cost. Mission and mission mobilisation needs to focus on youth. In Kenya 75% of the population is under 30. Another growing issue will be how do we tap into the population of retiring professionals keen to give themselves in service? 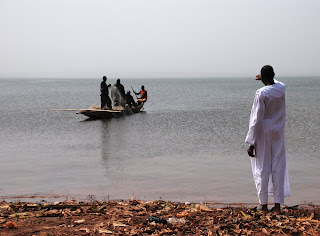 Need for equal and open partnerships between African and Western mission agencies. Need to expand beyond traditional connections with the Global North and West to form partnerships with mission in Asia and South America (an iServe Africa alumnus recently went on a short term mission trip to East Asia). iServe Africa is a response to some of these challenges and opportunities. And we’re recruiting for the 2012-2013 intake of apprentices right now. 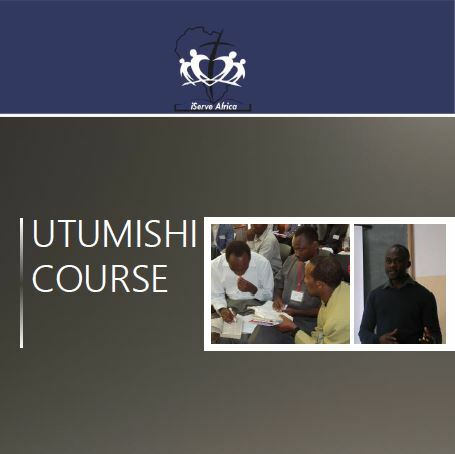 So if you know a recent graduate with a passion for the gospel and mission who wants to volunteer for a year and to grow in servant leadership and in faithful Bible teaching then please point them towards our website here where they can find out more about the programme and download an application form. Closing date 20 May 2012. This is a business where the aim is not to grow our empire but Christ’s, where we’re not trying to please shareholders but Christ, where we’re not promoting ourselves but the Cross of Christ, where the bottom line is not success but faithfulness, where we’re not trying to go up a corporate ladder but go down to serve, where we don’t want customers but disciples. This is a business where we’re not selling anything but holding out the grace of Christ, the righteousness of Christ, the surpassing worth of knowing Christ. 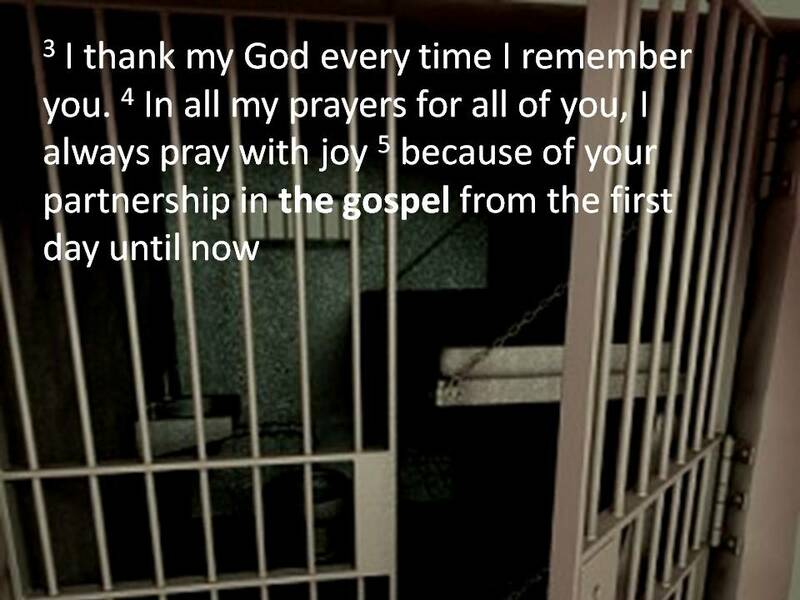 And Paul is so excited to be in that business with the Philippians – to be partners in the gospel with them. What does that partnership actually mean in practice? It’s all two-way. 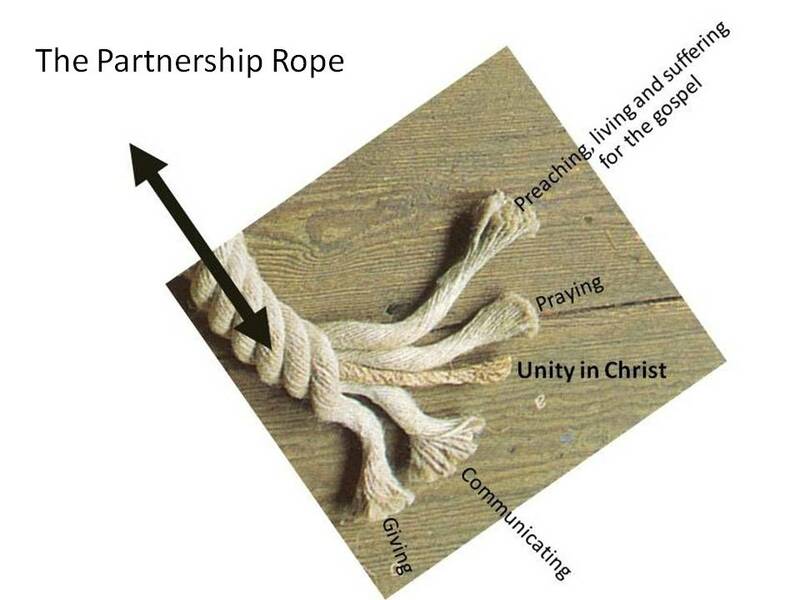 The central core around which all the other strands are wrapped is our Unity in Christ. 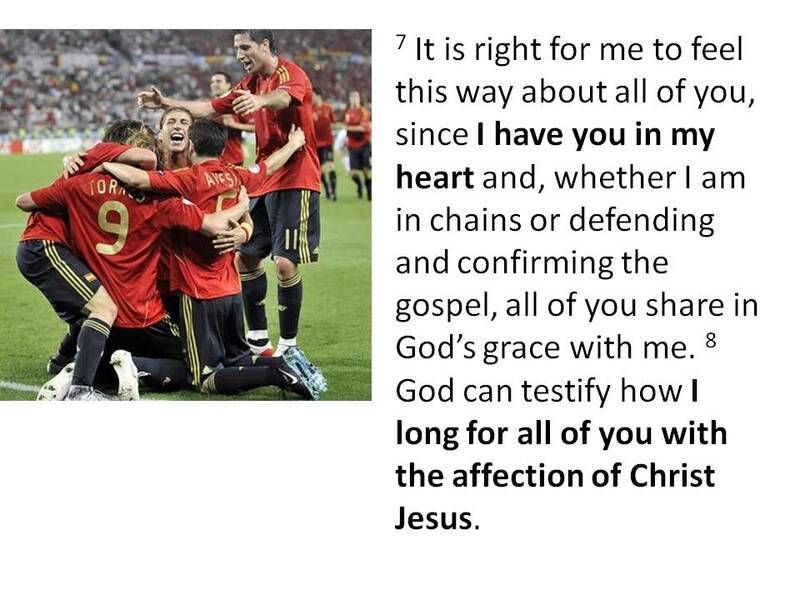 Paul and the Philippians are together IN Christ – the deepest and strongest unity you can possibly have. From day one Paul and the Philippians have been partners in preaching the same gospel, living lives worthy of the gospel, suffering together for the sake of the gospel. They’re prayer partners – Paul prays for them, Philippians pray for him. They communicate – by letters by sending and receiving people. They are partners in giving and receiving material resources. It’s not just about sending money and receiving prayer letters – it’s a relationship – incredibly close and warm – for an Englishman almost embarrassing warm – “my brothers whom I love and long for, my joy and crown” (Phil. 4:1). Later he calls Epaphroditus, his “fellow soldier”. Obviously our enemy is not human and our weapons are not human weapons. 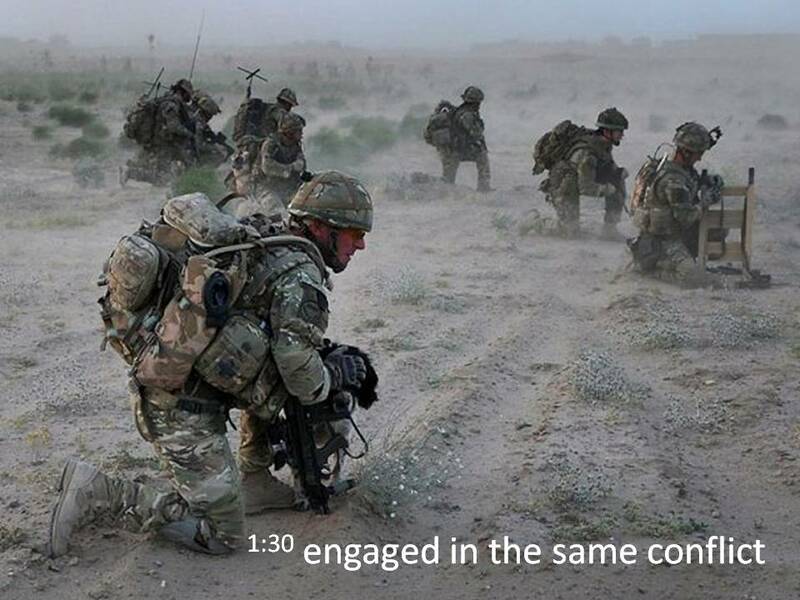 The point is – when we’re in partnership together it isn’t really that there are the guys on the front-line doing the exciting stuff and there are the guys back home. The mission front line is in Nairobi and Moyale and Wajir and London and Northampton. When we’re in partnership with one another – praying for one another and communicating and loving one another – it’s like we’re fighting side by side. Basically if we’re in Christ we’re all missionaries. It’s hard being a Christian anywhere in the world because we’re in a conflict (mainly with our own sinful nature) and it’s a wonderful privilege being a Christian anywhere in the world because we have Christ and we have one another. More emphasis on The Call or less? So that’s The Call – the main one. When it comes to this call perhaps we need to talk more about it. But what about the ‘call to ministry’ or the ‘call to the mission field’. Leaving aside the troubling implications about ‘ministry’ and ‘mission’ here (the wrong thinking that ministry is only paid gospel ministry and that the mission field is overseas) are we talking enough or too much about this ‘call’? In fact, Miles argues many of the failures, “are largely the direct outworking of the traditional approach to guidance and the ‘call’.” The article is well worth reading in full but here are his main points. The sense of a calling to a particular place and ministry can create its own problems which it is then brought in to solve. This sort of call is often based on circumstances (e.g. a chance encounter or a ‘fleece’). When circumstances prove challenging (e.g. bad health or opposition) then that is taken as a challenge to the calling. ‘Does God really want me to do this?’ I must then go back to the original (circumstance-based) calling to find the strength to carry on. The theology of the call can lead some mission agencies to place less emphasis on scrutiny and preparation of potential missionaries. What’s the alternative Miles suggests? Wisdom – godly thinking; thinking with other brothers; thinking within the framework of God’s great mission plan what might be the best use of my life. 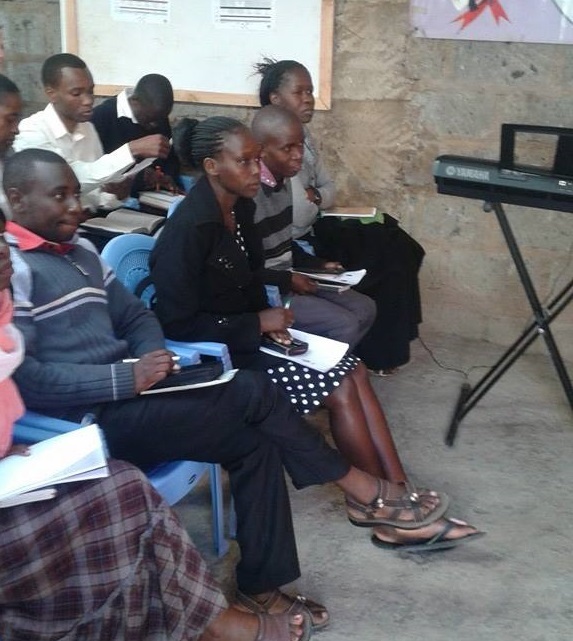 Church-based selection and preparation and sending of missionaries. Partnership – the Philippians model of believers and churches united in Christ, united in preaching the gospel, communicating, loving, praying for one another, sending people to one another across countries and continents. In all this we are not denying that there is a way in which Christ moves some people rather than others into the sphere of cross-cultural mission or pastoral ministry. Often this seems to happen through a combination of factors – an inner desire and willingness (1 Tim. 3:1; 1 Peter 5:2), the opening of a door (1 Cor. 16:9 – but look at the end of this verse! ), a Macedonian appeal (Acts 16:9), force of circumstances (Acts 8:4), what we have been entrusted with (Matt. 25:14-30) and the recognition and commendation of others (Acts 6:3; Phil. 2:19-22). The point is – should we call this ‘the call’? And are we laying too much emphasis on personal calling to ministry? Have we privatized or overly-narrowed the process? And what are the wider issues in our context that feed into this? The question of how we hear from God? Individualism? Dualistic separation of the spiritual and the mental or the sacred and the secular? Taking our models of ministry from Old Testament characters (e.g. the calls of the prophets)?